The first ever integrated Resorts (IR) Development Project in the Maldives has been launched by President Abdulla Yameen Abdul Gayoom. 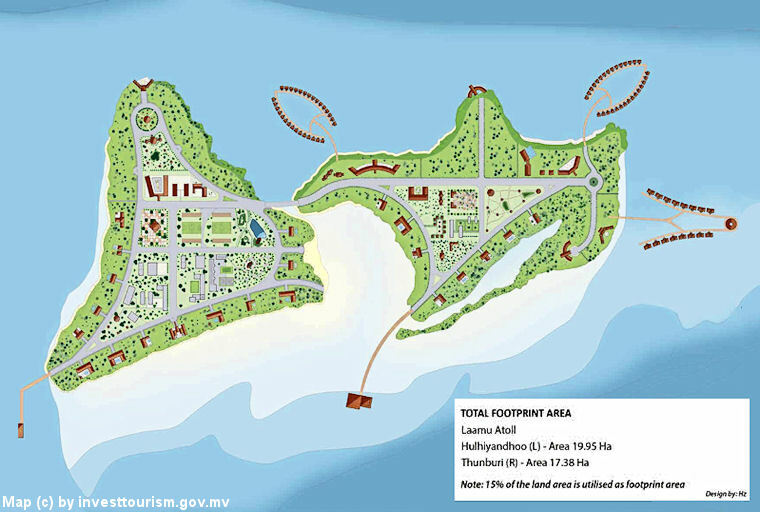 Thumburi IR development project is the representation of his vision for guest house islands which were outlined in the PPM tourism manifesto. The project plan is to place the guest house concept in Thumburi and Hulhiyandhoo islands located in Laamu Atoll, in the North of Maldives. With a projected increase in the number of tourist arrivals by 2017 by over 150,000 to the current 1 million plus arrivals, the project will include 23 hospitality properties effectively having 2,100 new beds, which will create 4,000 new jobs. The plan to develop IR in the Maldives is one of the most inviting investment options in the tourism sector. The project is planned to expand the Maldives tourism product to engage the mid-market segment to bring socio-economic development to the region, also by creating opportunities for investment for local small and medium enterprises. The project offers chances for SMEs to invest in tourism related products such as guesthouses and sub-sector products like dive centres, watersports and restaurants. The Maldives economy is dependent on tourism on a large scale. Tourist arrival to Maldives reached 1 million last year. With an increase of 17.4% from 2012, 1,125,202 tourist arrival were recorded by the end of December 2013.